Do you remember when you were a kid and got a new pair of sneakers and how you couldn’t wait to put them on to see if you could run faster and jump higher? Well, I still feel like that when I get a new pair of running shoes. I hadn’t gotten a new pair in awhile so when I got some Christmas cash, it was immediately earmarked for new running shoes. Running shoes are expensive and they usually aren’t on sale. For the record, “sale” is one of my favorite words. I buy EVERYTHING on sale – except running shoes. But it’s money well spent. Good running shoes keep your foot stable and cushioned (but not too cushioned) against the impact of running. Have you ever tried to start running and were immediately plagued with shin splints? Aside from the fact that your body has to get used to the new activity, that can also be caused by wearing the wrong shoes. The “wrong” shoes aren’t about a certain brand or model. They’re about wearing either old, worn out shoes, or shoes that aren’t suited to the way you run. The best way to get shoes that will work for you is to go to a running store. A good running store will look at the wear patterns on your shoes, ask you about your activity level and goals, and watch you run in various shoes to make sure you get the right pair. I bought my first pair of “good” running shoes at Team Nashville on West End here in Nashville. Since then, I’ve purchased shoes in each of the area running stores and I’ve always been pleased. I’ve been running in Mizuno Wave Inspires for about 6 years now and, while I love the fact they are lightweight, well-cushioned and stable, I’ve been thinking that maybe it’s time to change it up a little bit. So I took my Christmas money to NRC (Nashville Running Company), a great store that opened a few years ago only a few miles from my house. 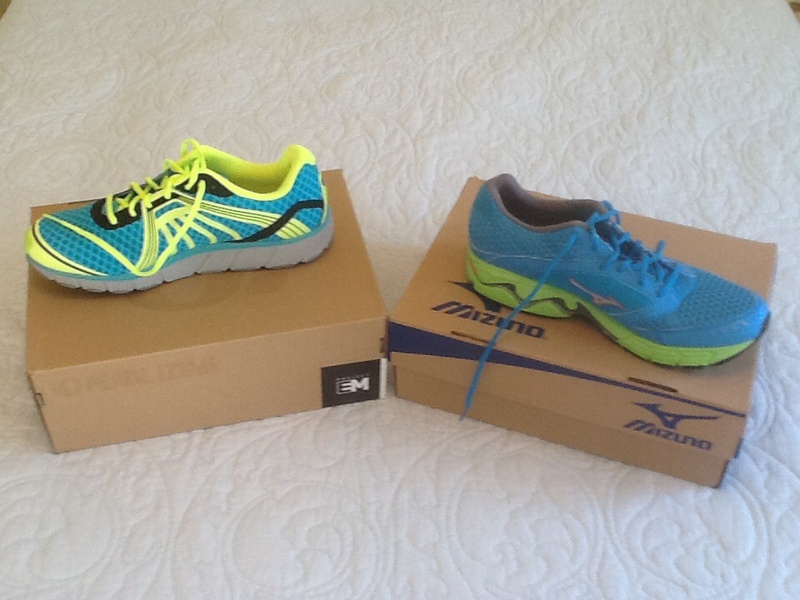 They fitted me with a sweet pair of Pearl Izumis, which I purchased along with my faithful Mizunos. Typically, I go through a couple pairs of running shoes a year. I can tell when its time to replace my shoes when several runs in a row are sluggish or my legs start to hurt. Then, I’ll (finally) turn my shoes over and discover that the bottoms are pretty worn out. So, what do you do with the old running shoes you acquire over the years? Usually I’ll keep a few old pairs for walking the dog, non-running gym workouts and yard work. The rest I donate. Many organizations accept donations of used running shoes. My local running club, East Nasty, collects gently used running shoes that are donated to both local student runners and beginning runners participating in our popular couch to 5k training (called “Potato to Tomato” because the participants go from couch potatoes to running the East Nashville Tomato 5k). I’ve helped participants sort through the bins of shoes, and even put some of my old shoes on their feet. To put my shoes on the feet of beginning runners who are excited to have them keeps me excited about donating them. So my beautiful new shoes will eventually end up on the feet of someone else. But in the meantime, I can’t wait to get out there and log some miles in them.